The laboratory mill is designed for customers who want the versatility of being able to process both fine and coarse material without purchasing two complete mills. Union Process, Inc, a manufacturer of particle size reduction and dispersion, has built its first combination mill comprised of an S1 batch mill combined with an SDM-05 mill designed to operate as a bead mill. The laboratory mill is designed for customers who want the versatility of being able to process both fine and coarse material without purchasing two complete mills. The S1/SDM-05 combination lab mill provides the option to run at slower speeds (approximately 100–500 RPM) while the SDM option runs at higher speeds (300 - 2000 RPM) and utilizes grinding media as small as 0.25 mm up to 2 mm. The SDM option features a shaft with specially designed agitator disks, which are available in tool steel, stainless steel, plastic, or zirconium oxide, and a side discharge with screen. Customers may choose from two drive systems - the electronic variable frequency drive (explosion-proof or non-explosion-proof) or the mechanical variable speed drive (explosion-proof). Either system is available in a totally metal-free configuration, if required. 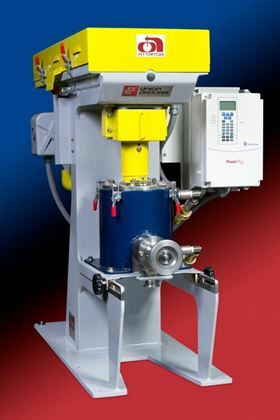 Union Process Inc has introduced a combination laboratory mill which can process both fine and coarse material and/or perform multiple-stage grinding.